Welcome to my last Anisong round up for 2018. Though the fall season is mostly finished outside some continuing simuldubs and Winter 2019 is already getting underway with some eagerly anticipated new shows and sequels, we had a pretty stocked fall lineup. Kicking things off is the opening to the spiritual successor of one of my favorite hero based/buddy cop style anime shows. With it’s quick build up in the first 10 seconds and jamming guitar work to match the opening’s action sequences, newcomer Kirisame Undertaker really shines in their debut single “Stereo to Monologue.” This would probably be my favorite anisong of the season if we removed the CGI. Plus, I can appreciate a band who shares the same taste in fashion from their music video (heh). Not to say the plot has taken a complete back seat, mind you. This time, singer Mayuri teamed up with rock band My First Story to perform this season’s opening. Though lighter in tone compared to last season’s Winding Road by Man on a Mission, Reimei covers a lot of those particular musical cues I look for in my playlists: a strong guitar throughout, clean vocals, and if lucky, some classical instrumentation (if you listen with headphones, you can pickup some light piano). I’m particularly fond of the chorus and shared vocals between the two vocalists. So we’ve reached the halfway point which is where I started to have a harder time picking just one anisong for this list. Between the opening and endings of SSSS.Gridman, this one was a tough choice because I absolutely adored Union by OxT for similar reasons as the pick above, but loved the visual throwback to a Saturday morning cartoon; except if they looked much better and were animated by Trigger. Instead, I went with the ending sung by Maaya Uchida. While I felt the opening’s visuals were stronger, I loved the contrast between the realistic backgrounds and anime characters. Plus having watched the series in full, the ending song takes on a whole new (and somewhat emotional) meaning if you’ve seen the ending. It’s a bit hard for me to write this out without giving away the big plot twist that happens midway, so I’ll just leave it at this: Go watch SSSS.Gridman if you haven’t already. In fact, stop reading here and go watch it. Say what you will about Goblin Slayer. Despite its obvious flaws and failure to live up to its original premise in the pilot episode, I had fun with this show. Much like Radiant (the other series I had high hopes for this season, but pending), the anime did at bare minimum introduce me to the series and will likely send me to bookstore in search of manga while I await the inevitable season 2. I actually had Mili’s “Rightfully” set in stone when I initially drafted this (check out this weird music video), but the season finale came and I had to carefully rethink this pick. We may be reading into this too much, but my point is it was a beautiful moment that highlighted how much GS’s world has grown at least somewhat since forming a party and learning to confide in others. I can’t say how much of this will carry over whenever the series inevitably returns, but my takeaway is there is hope for our lone hero. This season had a few surprises in store for me, but the biggest one that came out of left field came from a genre I almost never dabble in. If you would have told me at the start of the season that I would be watching an idol anime, much less ranking it as possible AOTY contender, I would have never believed it. For the idol genre, music plays a much stronger role compared to other anime. Not surprising, Zombie Land Saga had multiple songs that could have easily been placed here. From the colorful and catchy opening (Adabana Necromancy) to the more melodic ending (Hikari), Franchouchou left a strong impression on me that it was difficult for me to narrow it down to one specific song. After much careful consideration, it ultimately came down to arguably the two best episodes of the series that not only featured some of the best performances overall, but also highlighted what makes Zombie Land Saga so special. And while Lily’s episode hit an emotional soft spot, Saki’s episode and follow up song in a lot of ways emphasizes everything I love about this show. It embraces the absurdity of its own premise, but not to the extent that it completely overshadows each of the undead girl’s previous lives and coming to terms with it in their own way. Long after Tokyo Ghoul ends, “unravel” by TK from Ling Tosite Sigure will no doubt always be intertwined with this franchise. It’s been such a constant throughout the series that I’ve counted at least at least 3 times within the series that it has been played; the end of Tokyo Ghoul, the end of root A, and somewhere in the first cour of :re. So its fitting that the same artist return for what will likely be the final arc of this show; and they returned with a vengeance! While unravel will always be the shows “main theme,” they really outdid themselves this time. Starting off slow, it builds up really slow and just hits hard 30 seconds in. Katharsis is kind of a messy song of contradictions, but it fits well given this arc’s uneven trajectory and habit of getting much worse for its evergrowing cast of characters before it gets better. These last few seasons haven’t been doing much for me, and while I may never hold up Tokyo Ghoul on the same pedestal as some of my peers, it’s been a fun ride. Here’s one I’ve actually known about for while, but had to patiently wait for Netflix to upload and then went off my radar until it magically popped up without prior knowledge. I just really like this collaboration. I want to know the defeat. This song just slays. I just wish the video were a bit more interesting though. There you have it, my favorite anisongs of the season. What were some of your favorites of the fall season? Favorites overall of 2018? 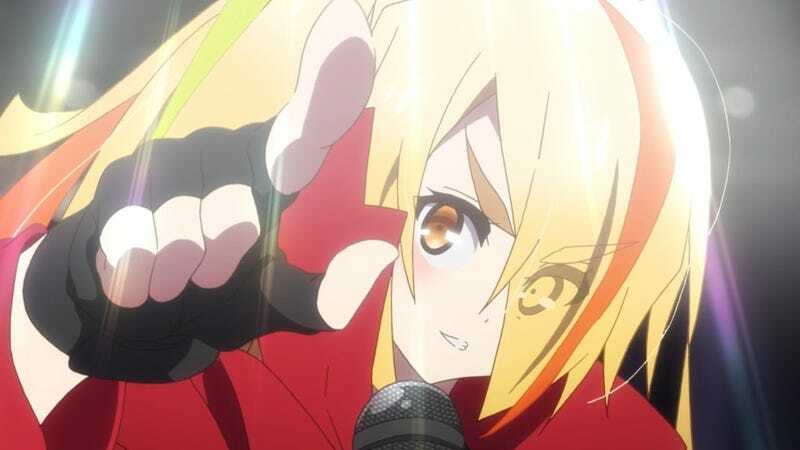 Best girl of Zombie Land Saga? Feel free to hit me up in the comments section below. Once again, thank you for reading and following these posts. Hopefully, I will hear from you in the current simulcast season and your thoughts for the Spring Season and 2019 in general. One final note before I go: Normally, I reserve the credits for a personal favorite song that doesn’t fit anywhere above (i.e. past season songs I missed, an extra from a series I already highlighted, etc. ), but this time it’s for a show that actually did start its run in the fall, but didn’t watch as I’m on the previous arc. Still, I did give it a listen; and loved it. Since I’m likely to revisit this whenever the English dub catches up, I wanted to spotlight it while also giving something new to those who are currently watching it. Enjoy!